6005CTPPY-1 is a preset industrial grade, click type torque wrench. 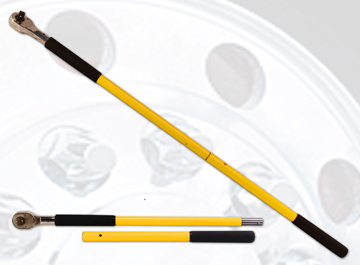 It was developed for the use to properly tighten lug nuts on truck, trailer, and heavy equipment wheels. The handle is a black, slip on, durable rubber handle. It is equipped with a 1" drive that has a bidirectional, heavy duty, 36 tooth quick release ratchet. The wrench can be preset from 100-600 Ft-Lbs. It easily separates into 2 pieces for ease of storage. It is brightly colored in safety yellow for high visibility. It comes in a blow molded case with a small padlock. It meets all ASME B107.14M-1994 and ISO standards. It comes with a 1 year warranty on manufactured parts and workmanship.